In a previous guide, we discussed the nuisance of house ants. However, these pesky creatures aren’t the only ants that can wreak havoc on your home. Another ant type that Californian homes see is the carpenter ant. Learning how to identify these ants and understanding what attracts them to a property can go a long way in helping you rid yourself of these pests. Here at Earthwise Pest Management, we provide home pest control in Sacramento and surrounding locations. Not only do we provide help with insect extermination, but we are also passionate about providing our clients with the knowledge they need to understand the pests that invade their home. Check out this comprehensive guide to carpenter ants and find out if these are the creatures that plague your property. A much larger ant than your normal household ant, a carpenter ant is around ¼ to ½ of an inch long. In fact, carpenter ants are the largest ant that exists in North America. These ants are usually dark black with dark red legs, although there is a smaller species that is yellow and black. A carpenter ant is aptly named, as it spends its life chewing through wood to build its home. Unlike your common house ant, a carpenter ant will quickly leave a wake of destruction behind. While it does not consume wood in the way a termite does, a carpenter ant will hollow out wooden structures in order to build a nest and to create tunnels for its colony. This can lead to structural damage to homes and other buildings. Usually, a carpenter ant will start chewing its way through damaged or decaying wood. However, if needed, a carpenter ant will gladly gnaw its way through new building structures in order to create a safe colony. When it comes to food, carpenter ants eat a variety of items. They will feast on dead insects, attack and eat living insects, or enjoy a sweeter food source, such as nectar and fruit juices. Not only will carpenter ants destroy wood in and around homes, but they also can use their strong jaws to bite anyone they come into contact with. Not only can they bite humans painfully, but carpenter ants also excrete a formic acid into the bite wound, creating a painful, burning sensation. Due to their size, it is fairly simple to tell the difference between a carpenter ant and a normal house ant. These ants feature one bulge at their waist and have a smooth back. During mating season, males and females will feature a set of wings, which can make them easy to confuse with another wood lover — termites. However, carpenter ants feature a much different body type than a termite. Termites have broad waists, whereas carpenter ants have an extremely skinny waist leading up to a large abdomen. The wings on reproductive carpenter ants are also different than termite wings. Termites’ front wings and back wings are the same size, whereas a winged carpenter ant features a smaller back wing than front wing. Carpenter ants are fascinating creatures, and, as is true with other ant types, they are a social insect operating within the construct of a well-formed colony. The queen ant features wings and takes flight to mate during the spring months. During this season, new reproductive males will also feature wings, which allow them to take part in this mating flight ritual. Once the mating flight is over, the male will die and the queen will then search for a suitable nesting site. Nests can all be interconnected through a vast array of tunnels. Each satellite nest will connect to a queen nest, where one or even dozens of queens can reside, laying eggs. Nests will be built and tunnels will be formed all through the carpenter ant’s powerful ability to chew through wood and create the space needed for their home. From walls to insulation to doors, carpenter ants will create their colony in whatever space they can. During their lifespan, they can cause severe structural damage to a building’s wood, not unlike termites. If you have an infestation of carpenter ants on your property, you will want to attend to the matter as soon as possible. As is true with most pests, reproduction will happen rapidly and the infestation will only worsen with time. 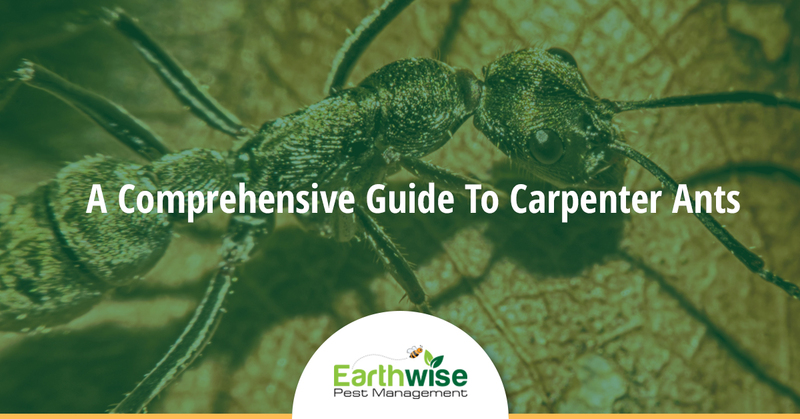 Here at Earthwise Pest Management, we can assist you in identifying carpenter ants at your property and in determining what the best plan of action will be for you. Due to their destructive nature, carpenter ants can be a cause for serious concern. If you believe carpenter ants have taken up residence in your home or around your property, talk to our team right away. We look forward to assisting you with home pest control services in Sacramento and surrounding locations.